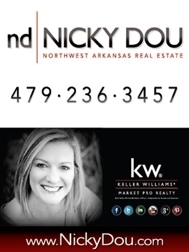 Meet Nicky Dou, Best Realtor in Northwest Arkansas! Nicky Dou is an Executive Broker and Sr. Vice President at Keller Williams Market Pro Realty in Northwest Arkansas. Nicky ranks in the TOP 1% of all REAL ESTATE AGENTS in Northwest Arkansas. NICKY DOU WAS THE #1 RESIDENTIAL REAL ESTATE AGENT FOR ALL OF NORTHWEST ARKANSAS in 2014, 2015 & 2016. Nicky came in #2 in 2017. Nicky is ePRO, an Accredited Home Staging Specialist, ecoBroker and Luxury Home Specialist. If you are looking for Real Estate in Bentonville, Fayetteville, Springdale, Rogers, the Beaver Lake area or any other town in Northwest Arkansas, give Nicky a call or text her @ 479.236.3457. Nicky Dou was born and raised in Springdale, Arkansas and has resided within Northwest Arkansas for over 40 years. A valedictorian graduate of Springdale High School, she was actively involved in sports, cheerleading, student leadership programs and was Homecoming queen. She also holds a Bachelor of Art's degree in Communication from the University of Arkansas, Fayetteville, where she was an active member of the Zeta Tau Alpha sorority. Nicky is married and has a beautiful 13 year old daughter, Madison. The Dou's enjoy a wide variety of what Northwest Arkansas has to offer. Whether its boating on Beaver Lake, riding ATV's and camping in the Ozark National Forest, enjoying Dickson Street's live music, enjoying Crystal Bridges Art Museum or attending an Arkansas Razorback athletic event, these are some of the countless reason why Nicky and Jerry call Northwest Arkansas HOME. In Nicky's professional career, she strides to be the best in selling real estate while providing superior customer attention and service. Nicky "thinks outside the box" and has a passion for real estate and marketing. Ask anyone in the real estate industry in Northwest Arkansas and they will tell you Nicky Dou is "the marketing/technology/social media expert" - for real estate in Northwest Arkansas. Nicky also enjoys art, photography & decorating (which helps tremendously in helping sellers get their Northwest Arkansas home ready to sell). Give Nicky a call or send her an email today if you are thinking about buying or selling your Northwest Arkansas HOME! Nicky began her career in Real Estate back in 2001 at Harris McHaney Realtors. She climbed to the top sales agent position in her office quickly and decided to start up her own company. Nicky and Jerry Dou owned and operated "Element Realty Group" for just over 2 years in the Northwest Arkansas area. Although she loved running her own company - it really took her away from her true passion - working with her clients and selling & marketing homes! In November of 2007 Nicky joined forces with Coldwell Banker Faucette Real Estate where she was ranked the #1 Coldwell Banker agent in the State of Arkansas while she was with them; in 2008 Nicky joined Century 21 Exclamation Realty - located at Village on the Creeks in Rogers until February 2013 when Century 21 & Coldwell Banker in Northwest Arkansas "merged companies". Back again at Coldwell Banker for 6 months when Nicky and Jerry Dou decided to take all of the valuable experience they had gained over the years and really put it to work for them. In September 2013 Jerry and Nicky Dou, along with their amazing licensed assistant, Jerilyn joined Keller Williams Market Pro Realty which has an office located in Bentonville and one in Fayetteville. Keller Williams allows the Dou's to run their businesss the way they feel they should and to best serve their clients. With Nicky's passion of marketing and being creative this seemed to be "the best fit" for them for their future goals in the real estate business. Call Nicky Dou with KELLER WILLIAMS in Northwest Arkansas to set up an appointment to list your home today. During the initial appointment Nicky will do a walk through and make suggestions on getting your home ready for the market. Nicky is an "Accredited Home Staging Specialist" and feels that in this business she feels that every home on the market could use some "staging" and Nicky has this down to an art. Nicky takes her job very seriously and treats each home she lists as if it were her own and each buyer's investment/home as if it were her purchasing for her family. Whether it's finding your dream home in Northwest Arkansas or getting top dollar for your home, Nicky Dou will ensure your goals and real estate needs are fulfilled. Nicky was told once, "if you find a career you love, you will never have to work a day in your life!" Nicky loves her job and would not trade it for another! For superior and professional real estate services in the Fayetteville, Springdale, Rogers, Lowell, Elm Springs, Bentonville, Bella Vista, or Beaver Lake area, please do not hesitate to call Nicky Dou 479.236.3457. You will be glad that you did! "THE BEST REAL ESTATE AGENT IN ARKANSAS"
I knew putting the job of selling our home, and under the circumstances of relocating our family out of state so doing a lot of this remotely, I had to have the best of the best. Nicky is a true professional and expert at what she does. She sold our home in 2 weeks, kept us in the loop on every single detail up until the house closing, and did so with the up most honesty, integrity, and professionalism. My husband and I feel so grateful that we choose Nicky. She is #1 for a reason and gives her clients her everything at every step of the process. Thank you Nicky Dou!! We used Nicky to help us sell our house. She was very helpful and knowledgeable about the local real estate market. Our house was on the market in the $400,000-$500,000 range in the Northwest Arkansas area. She handled high maintenance buyers with ease! Skilled negotiator with her clients best interests in mind. We would use again and would highly recommend to anyone looking to buy or sell a home. We used Nicky as our selling and buying agent. She sold our house in 13 days and we had a showing almost every one of those days...and sometimes twice in one day. She is a very clear communicator and I have and will continue to refer friends to her! This year we decided to downsize and we used Nicky Dou to both sell our home and purchase a new home. Nicky was such a pleasure and so amazing to work with! We listed our home and within 30 days it was sold thanks to her impressive market knowledge and ability to professionally market our home! We couldn't be more happy with the results and would highly recommend Jerry or Nicky to anyone considering selling or buying a home. My husband and I had the unique opportunity to work with Nicky Dou. I, myself, have been a licensed realtor in Indiana and had high expectations when it came to purchasing our home. My husband accepted a career opportunity in Bentonville. I started by researching qualified agents and feel so thankful that I found Nicky. She exceeded all our expectations and we could not have had a better experience. Nicky, is not only super knowledgeable about the area, but truly listened to us and set up additional showings on the spur of them moment. We were able to write an offer on our home during our first house hunting trip. From my experience as a realtor, I can honestly say, this is not the normal house hunting experience, especially when moving across the country. Once we purchased our home, Nicky continued to provide excellent customer service. She made herself available to meet with contractors at the house while we were still in Indiana. Nicky gave us several recommendations of contractors who turned out to be just what we were looking for. Our entire experience of working with Nicky could not have been better. "Nicky was beyond magnificent during the sale of our old home and the purchase of our new one. Her staging photos made our old home appear to be showcase quality and her website traffic and promotion quickly drove prospective buyers to our door. We had a full asking price offer in only 8 days! While looking for our new home she led us to homes she knew would fit our style. There were even a few times we called her about a home and she said "You know...after know what I know about your likes and dislikes you guys won't like this particular home." Nicky made herself available to us at all times via text and email and went above and beyond the normal tasks during the closing phase on our new home. I have praised her on all of my social media accounts and will drive every last person to her I can. She is truly a "five star" realtor and, in my opinion, the best in northwest Arkansas." Nicky is one of the top Realtors in NWA for a reason! She works very hard for her clients both as a buyers agent and as a sellers agent. She has a solid grasp on the value of technology and social media in today's market, and is likely one of the most visible realtors in NWA on the web. She is very personable and highly professional. I enjoy working with her and her clients very much. I highly recommend Nicky Dou! "Nicky Dou has sold several of our high end homes. Her marketing abilities and E Commerce knowledge is at the top of the Real Estate Industry. She really works hard to get the deals put together so that all involved are very satisfied with the value they derive from the transaction." "Nicky is the consummate real estate professional. She has passion for her work and her clients and her knowledge of the real estate business in Northwest Arkansas is exceptional. I highly recommend Nicky whenever I come across someone who is in need of a real estate professional in Northwest Arkansas." I run a Global Staffing firm. With several large clients in Northwest Arkansas I oftentimes have candidates relocating to the area. I always recommend Nicky. She approaches her job like the best software sales people I deal with. She knows the subject matter, understands the market, and knows how to negotiate. "Jeremy and I couldn't be happier in our new home, and we owe it all to you. While we know you were swamped, you always made us feel like we were a top priority. Your personal attention to our selling/buying won't be forgotten! Thanks for all your help!" "Nicky is one of the best Realtors I know. Her ability to market a property and her work ethic are second to none. I always expect superior results from her because she produces them consistently."